Everyone who has spent time working with wood knows that the moisture levels can vary from piece to piece and from source to source. They also may have seen their wood change after it was delivered to their shop or job site – twisting, cracking, warping and otherwise not retaining its shape or dimensions. When working with wood to create your own projects, this can be problematic. 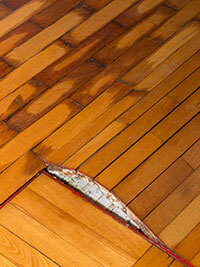 When working with wood flooring, this can be disastrous. Why does it happen? Wood is a hygroscopic material that absorbs and releases moisture from its environment, and until it is fully sealed, this is an ongoing, never-stopping process. Sawmills and wood product manufacturers invest heavily in monitoring wood’s moisture content (MC) and removing excess moisture from the wood. However, even with their care, once the wood is transported to another location, the moisture cycle of wood will continue to work to try to balance with its environment. How does that present a problem for the people and professionals who work with wood? Any time MC is too high (or too low) for its use and environment, the end result is put at risk, along with a few other things along the way. First, let’s look at some of the challenges if the wood is too “wet” or has a high MC. Wood that has a high MC level will begin to shrink in all dimensions as it begins to lose that excess moisture. Most impacted, though, is width and thickness. If you have fit wooden floorboards together that have excess moisture, that change in dimension can lead to cupping, gaps, or buckling. Not a pretty sight and, in extreme cases, a safety hazard too. 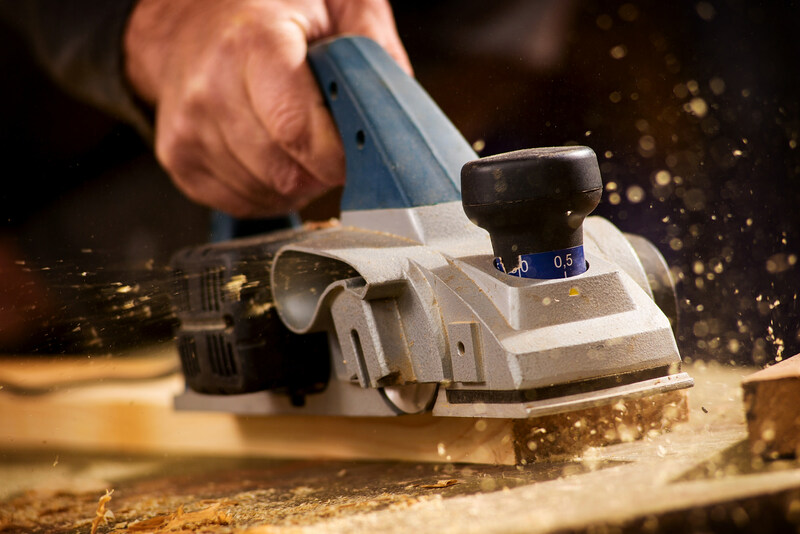 Trying to put “wet” lumber through a planer, a jointer, a sander or even cutting it with a saw can cause both damages to the tools and danger to you. Wet sawdust or shavings catch on blades and other moving parts and can effectively “gum up” the works inside a machine, or promote rust on metal parts (like knives) and shorten their lifespans. High MC wood is also more prone to catching or kick back. Wood with higher MC levels is also at risk of additional damage during the working process. Because the wood fibers are, in effect, softened with the additional moisture, tools are more likely to tear or rip the wood instead of cut it. Tear-out, checking, and gouging is more likely on high MC lumber. Even sanding can tear up the surface, rather than smooth it when the wood’s MC level is high. It’s also a must to remember that after the wood dries, the chances of cupping, raised grains, burring or dimensional changes mean the wood may only need to be worked again. Unless you use glue or adhesive specific to wet situations, high wood MC can mean glued joints do not hold properly over time. If the wood dries after it has been glued, that inevitable shrinkage will put joins at risk as it tries to pull away from the other woods. 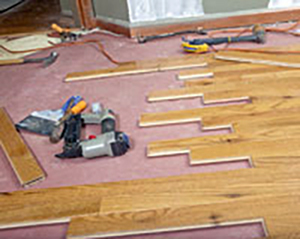 For furniture joins or glued-down flooring, where use adds stress to the join, this can be disastrous. Moisture can also slow glue curing times. What about the reverse situation? What if wood’s MC level is too low? Just as drying wood shrinks, wood that is absorbing moisture from its environment will swell in size. While that might cause a tight fit or even a potential split, in some wood projects and in wood floors it can also cause crowning or buckling. Overly dry wood can be more brittle, meaning nailing, sawing, or other aspects of installing or woodworking can lead to splits, cracks, knot loss and other damage, particularly if working across the grain. Trying to carve or turn overly dry wood can also lead to more splintering on the surface. Chisels, saw blades, drill bits, and other tools can also dull tools faster than wood that is at the correct MC for its area and species. Ultimately, there is a variety of reasons to monitor wood MC, as both levels that are too high and too low can be problematic. How can you tell which is which? When Is Wood Wet (or Dry)? If a living tree has just been cut, it’s wet. That’s a guarantee. After that, though, any rule of thumb will be no more than an estimate. While there are many guides or tables available to help identify the correct MC for a wood species or a geographic region, ultimately MC is best monitored with an accurate wood moisture meter. Even within one geographic region, temperatures and ambient humidity can vary. In interior installations, the operation of the HVAC system will play into wood’s MC levels. Wagner Meters’ wood moisture meters give you fast, accurate and easy-to-operate assessments of wood MC. Their non-damaging pinless technology even lets you “scan” many board feet of lumber to help identify potential wet spots or changes within wood stock or wood flooring. Once wood or wood flooring is delivered to its job site, a pinless meter lets you easily monitor the changing MC of the wood. The target, really, is to identify the point when the wood has reached a balance with its environment, a state referred to as equilibrium moisture content or EMC. Think of EMC as MC in context. The natural give and take in wood with the moisture of ambient humidity will eventually come to a resting state, and that will be the best time to move ahead with the woodworking or the wood flooring installation. And knowing that your wood has reached its EMC will give you the confidence to move ahead with less risk of a project damaged by an MC level that is too high or too low for conditions. What happens if you drain green wet wood will it peel off later as it dries? Mary, in all likelihood, there will be problems later on if you stain or paint green wood. Green wood does not provide a good bonding surface for paint and does not allow for stain to properly penetrate into the wood. What happens if I oil a fresh cut round of hardwood before it dries. 1 week after cutting, just for the sake of looks, no structural use.. just art. You can oil green would but only certain oils will actually dry and not just stay a tacky mess for weeks, or months after you oil them. Boiled linseed oil seems to be the oil of choice for green wood, sometimes in a 50% mixture with turpentine. The reason for linseed oil is that it is breathable and will allow the wood to reach equilibrium. The other oils, such as Tung, Danish, or Teak oil, are not breathable, and will never actually dry. Hi, I accidentally painted my outdoor porch columns when they were too wet I think? Will it dry out eventually? Should I remove the paint somehow to let it dry first? I live in Louisiana. So, we are pretty humid always. They are yellow pine I think. I put a moisture meter that I got from lows, about $30 cheap pond and it read 100%. Gulp. It is treated lumber and I did let it dry 6 months before painting. It did rain the day before and I wasn’t thinking. I have one column left to paint and am Unsure of how long I should wait to paint it. It won’t ever stop raining here it seems like. The bottom of the column is saying >70% right now, but I need to paint that one too. 1) Should I remove the paint from the columns that I accidentally painted when I think they were too wet? 2) I would more sugar content is it safe to paint the remaining cplumb that I haven’t painted yet? Since you have already let the pressure treated wood acclimate for 6 months it sounds like you are on the right track. Generally speaking though, you will need at least three days of dry weather before painting any exterior surfaces. Also, with pressure treated wood, a primer is necessary in order for paint to bond to your columns. Make sure to use an exterior primer and that it is compatible with pressure treated wood (all primers are not the same!) and make sure to let it dry properly between coats. The inexpensive moisture meter you are using will only give you a very rough, ballpark figure of true moisture content. This is because the chemicals used in pressure treated wood will cause the meter to read abnormally high. I live in the high dry part of east Idaho and bring my hardwoods back from the Ozarks fresh from the sawmill. Within 6 months it has dried to less than 6% even though my lumber starts out at over 20%. It is almost impossible to turn or carve at below 6%. Would it be practical to re-moisturize this wood by soaking in water and if so how long, or would it be necessary to steam the wood? I have started carving bookstands from a single board and the dry wood really makes it hard. “Wood loses machinability after over-drying (under 8% MC for softwoods and under 6% MC for hardwoods). There was a good paper about this from Mississippi State University. Bringing the MC back up does not restore the machinability. 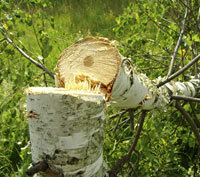 It is difficult to have lumber regain moisture to a higher MC, but it can be done. See DRYING HARDWOOD LUMBER for the procedure. Also, when trying to redry lumber, see the same book in about the same place. My research shows that some woodworkers use a 50/50 combination of water and 70% isopropyl alcohol sprayed onto wood pieces prior to carving to soften the wood. They all caution to avoid using too much of the mixture as it can cause checking or cracking. The problem could be a number of things or combination of things; water migrating from somewhere inside, or outside, the home through the floor or subfloor, the adhesive (if any) failing or combining with water, or even the possibility of insects or other pests being a contributing factor. Hi Tony, thank you for the useful article. I am building some furniture with wood that is not very well dry. I am concerned that I might have defects later on after I keep it indoors in a dry heated environmentan. Would that affect such a new furniture ? Since I have already built it, Would you advise me to paint it or leave it indoors until it becomes completely dry? If so, what kind of paint will be suitable? thank you in advance? Since the furniture is already built, the best thing to do is place it indoors, in a controlled environment, and wait until the wood equilibrates. This may take a few weeks, or longer, depending on the species of wood used. I suggest using a thermo-hygrometer to monitor the room conditions to ensure the conditions do not change drastically. A moisture meter would tell you when the wood was dry enough to paint. As for the type of paint, I recommend talking with someone at your local paint store for their advice. I really liked how you described wood with a high moisture content and how it changes depending on its environment. My husband loves working with his hands and is getting into woodworking, so I want to learn a bit more so I can help him pick lumber and other materials for his hobby. Thank you for the information about how the wood may begin to shrink and, if you’re fitting boards together that have excess moisture, they may cup, have gaps, or buckle. We are trying to buy a playground for our kids and the reviews say the wood was too dry. what could we do to fix that when we do buy it? paint it with what? we live in Greenville South Carolina.